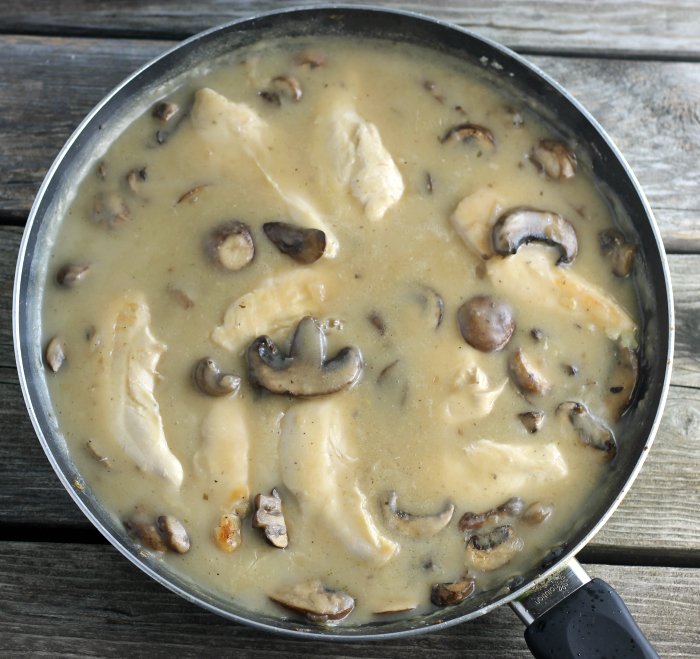 Skillet chicken with mushroom gravy is perfect for serve with mashed potatoes, rice, noodles, or baking powder biscuits. I grew up in a house where gravy was served with potatoes a lot. Back then I took the gravy my mom made for granted. It was just expected that when we had potatoes there would be gravy to go with them. I never thought about the extra time that it took to make the gravy. These days I don’t always take the time to make gravy, there is just so much that one can do and sometimes there is no time for such things. So when there is gravy it is something special. Like this gravy in the skillet chicken with mushroom gravy. We are finally seeing cooler weather and I have to say that I am happy to see it. I am sure by the time December or January rolls around I will be wishing for the warmer weather to return, but for now, I am liking the cooler weather. Mike left early Sunday morning for a business trip, which left me all alone for the day. I had decided to call my mom to see if she would like some company in the afternoon. My dad passed a little over eight years ago and I know she said that she misses having someone to share meals with, so when I can I like to share a meal with her. She loves mushrooms as much as I do and since Mike doesn’t eat mushrooms, I took the opportunity to make this skillet chicken with mushroom gray for the two of us. With the cooler weather, this was a perfect dish to take to share with my mom. It is easy to make, but the flavor is quite impressive. The chicken, mushrooms, and the gravy are all made in the same skillet, so you don’t have to worry about a lot of dishes to clean up. I served it over baking powder biscuits, but mashed potatoes, rice, or noodles would be perfect also. Or you know what? You can eat this skillet chicken with mushroom gravy as it is. That is what I did with the leftovers and it was just as good without the biscuits. Looking for some yummy comfort foods? 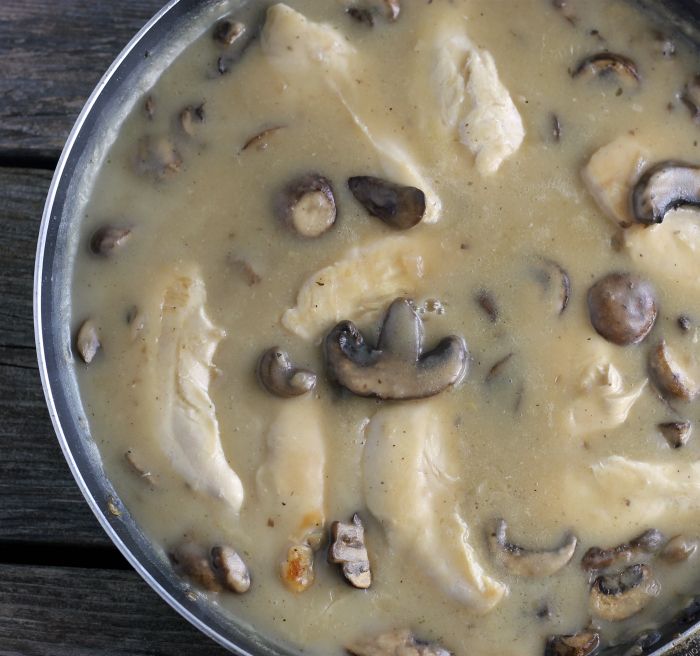 Try this skillet chicken with mushroom gravy. In a large skillet over medium-high heat, combine the butter and olive oil. Season with salt and pepper to taste. Place the chicken and cook until they are no longer pink inside. Time will vary, depending on the size of the chicken tenders. Remove the chicken tenders from the skillet. Add the mushrooms and onions cook for about 8 to 10 minutes or until slightly browned and tender. Season with salt and pepper to taste. Remove the mushrooms and onions from the skillet. Add the butter and flour to the skillet. Stirring constantly until the butter is melted and the butter and flour form a paste. Slowly add the chicken broth, whisking so lumps do not form. Once the broth is added continue to cook until the mixture starts to thicken. Taste to see if you need to season with salt and pepper to taste. Add the chicken tenders and mushrooms back to the skillet and simmer for about 10 minutes. Delicious and comforting! I am very sure you two had a great meal together. My hubby adores gravy, but I pretty much reserve it for Thanksgiving! I know he’d love this chicken sans mushrooms, though I’d happily eat his share!! !